So, the worst months of the year are finally out of the way. Here at Beau Bronz, we’ve survived the ‘Beast from the East’, battled against the westerly winds and dodged the downpours, but let’s face it: we’re still feeling out of sorts. And with spring knocking on our door, there’s never been a better time to indulge. After all, who doesn’t want some ‘me’ time to banish the post-winter blues? At Beau Bronz, we get it completely. If it’s an instant pick-me-up you’re after, then you’re in good hands. A professional Beau Bronz spray tan will leave your skin looking naturally sun-kissed, supple and moisturised in time for the arrival of warmer weather, and what could be better than looking like you’ve just landed from your winter holiday on your private Caribbean island? It sounds brilliant – but what if I’m a therapist myself and I want to become affiliated with Beau Bronz? Well, you’ve come to the right place! 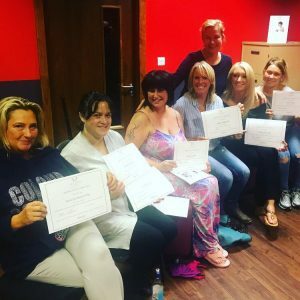 Currently, spray tanning expert Abi O is training students from all over the UK and beauty professionals everywhere all want to know the secret to perfecting her unique sunless tan. Who better to learn from than the spray tanner to the stars herself? Sounds amazing, tell me more! Beau Bronz Academy training days are usually delivered on a Sunday and students can expect to learn all about the natural, paraben-free ingredients which go in to making all of Abi O’s products so unique. Abi takes her time to talk each student through each Beau Bronz product, making sure the student fully understands how to use the Beau Bronz tanning products to create the desired colour for their client. Her step-by-step approach is tailored to each student individually, ensuring that every student is fully confident and competent to carry out a perfect Beau Bronz spray tan. Students who complete their training day will receive a Diploma from the Beau Bronz Academy, as well as the opportunity to become an official Beau Bronz tanning therapist. I’m interested – but what makes Beau Bronz any different from other spray tans on the market? When you book onto a training day with Abi O at the Beau Bronz Academy, you will learn a completely new method of spray tanning. At Beau Bronz, we believe that spray-tanning is an art. 3D contour tanning can be used to enhance and sculpt the body, making collar bones pop, making legs look longer and defining abs in the process. Why hide behind your natural beauty when you can be a goddess? And that’s not the only great thing about Beau Bronz. In addition to its goddess-transforming abilities, students and clients will find that it is completely and utterly natural! Yes, that’s right – All Beau Bronz products developed by Abi O are vegan, are free of formaldehyde, alcohol and sulphate…and the best part? The products are not tested on animals. WOW – Sounds amazing, when is the next training day?